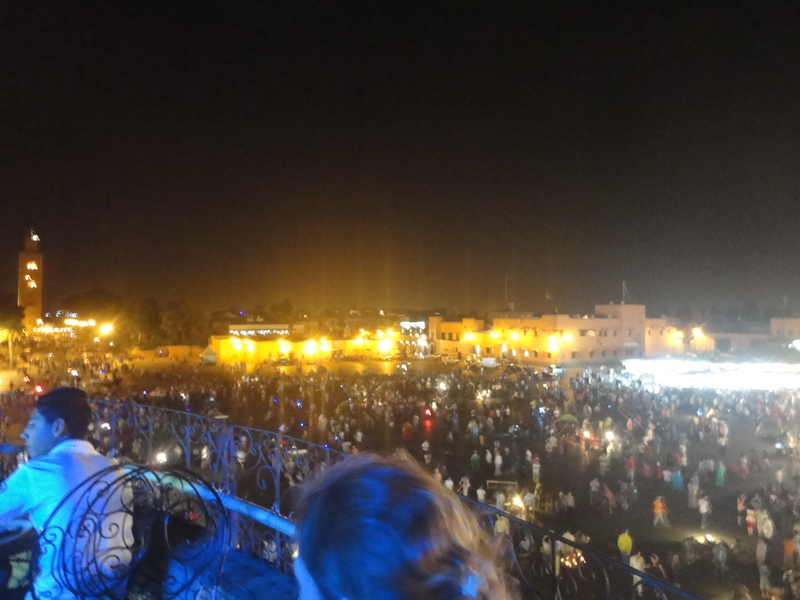 There isn’t a guidebook of Morocco out there that doesn’t list the Jemaa el Fna square as a highlight of the country. 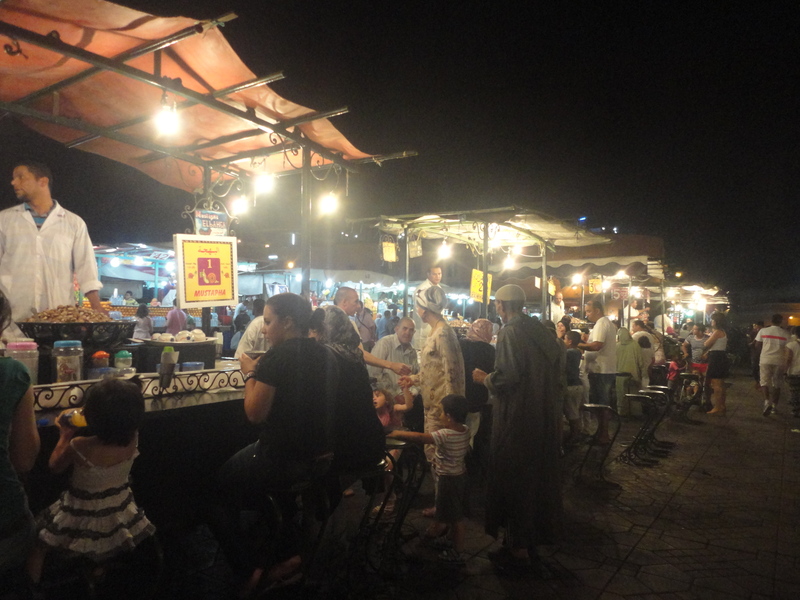 A picture of the chaotic marketplace and a frenzy of people are often accompanied with the words “essential experience”, telling of the wonders the place holds, and also about the tourist-famous red city of Marrakesh in which it is located. Its name is even a mystery, roughly translating to the “Assembly of the Dead”. This is very strange, given the lively and busy nature the square and marketplace seems to take on in photos and videos. I’m not one to buy into the most popular tourist places of the world, as their fame is lost on me and almost makes whatever the destination is seem built up on unrealistic expectations. The more unknown a place in the world is, the more intriguing it seems to me. 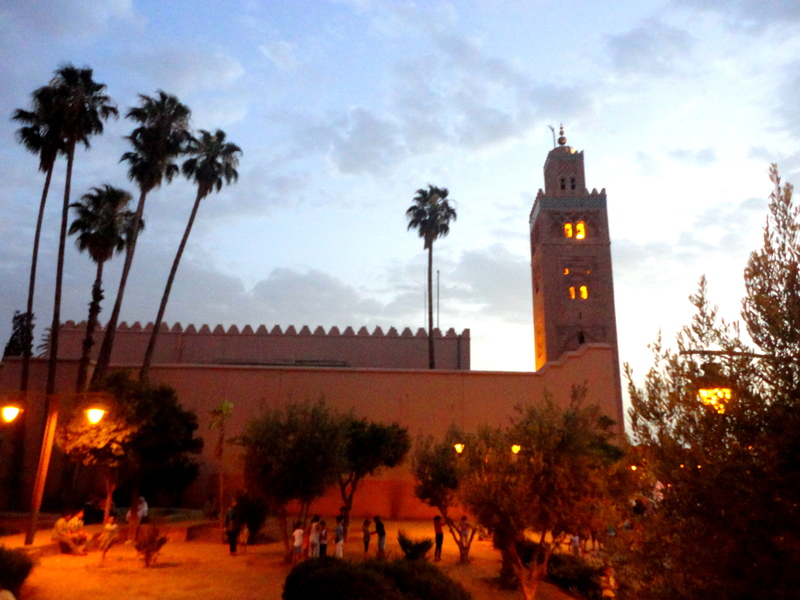 But nonetheless, as the sun began to set on a burning day in Marrakesh, the searing heat of the daylight dissipating only slightly, I found myself making my way to this very square. It was a free evening for me, so I hopped on the first bus from my hostel in the Gueliz neighborhood. It made its way past the red-hued buildings and towards the old city center, where the looming and beautiful Koutoubia mosque marked the entrance to the Jemaa el Fna as well as the medina. It seemed everybody was heading in the same direction, as if the square drew people in and the city itself were centered around it. One wide pathway served as the entrance , but it wasn’t nearly wide enough for the scores of people filing in as dusk settled over the city. Tourists with fanny packs, families, locals, and young foreigners like me mixed together in the crowd. Men on motorbikes expertly weaved their way out of the rabble, without hesitation yet not hitting a single person. An air of excitement and wonder hung over the crowd as it filed onward. Wary of the possibility of pickpockets, I keep one arm on my bag and one eye cautious of my surroundings, with the other eye looking ahead and above people’s heads to see the square coming into view. And I am in awe as the scene from my guidebook materializes in front of me. Steam rises up from cart after cart, outdoor restaurant after restaurant. People crowd around dozens of circles, watching everything from snake charmers and musicians to magicians to a man with a monkey. In the distance, clothing and bag vendors eagerly try to lure in passers-by who could be potential customers. As the guidebooks always did, there really was only one word to describe this place: chaotic. So much was happening in the small space, and there was no escaping it. Life was happening. The “death” name given to this square seemed more and more odd to me by the second. I let myself become ensconced in this chaos, let it mill around me and bring me in until I was a part of it. Curiosity overtook me and I wandered up to the first circle of people I happened upon to see what was going on. 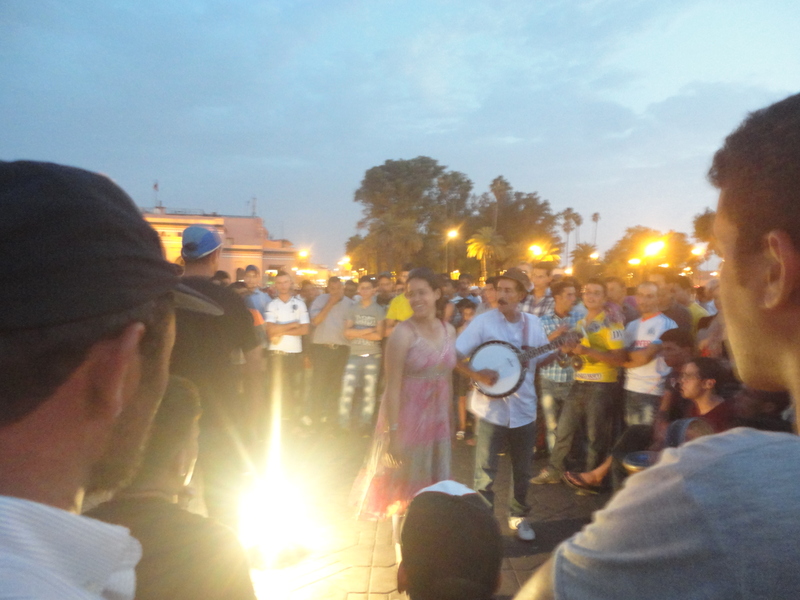 The man in the center of the circle had a small string instrument that looked a little like a gimbri-banjo mix, and was playing away on it exuberantly as the crowd looked on. The second I joined the circle, I caught the man’s eye and he immediately approached me with his hand held out, palm-up. The look on his face and the pleading smile gave away his intentions: he wanted money. Of course. Seeing as I had hardly witnessed any of his musical talents and had only then approached, I didn’t think he deserved anything yet, but I reluctantly pulled out a few dirham coins and placed them into his outstretched hand. The gimbri player pulled back his hand quickly, and examined his winnings for a moment before looking up again with a frown on his face. He made a sound of disgust and held his hand back out to me with a shrug, as if to say what I had given him was hardly anything. I could feel the eyes of the crowd slowly turning to me, the peer pressure setting in as the man continued to glare, head cocked to one side and arm outstretched again with a touch of annoyance. I refused to give in. My face formed a scowl as I observed the gimbri player’s demeanor, trying to work his magic and scrounge a few more coins. This man didn’t deserve any more than I had given him, and now he was purposefully making a scene to get more money out of me. I slowly backed away from the crowd and gave one last glare before turning on my heel and escaping. It didn’t matter anyway – soon another unsuspecting foreigner would take my place and the situation would repeat itself again. Just like that, it was as if the whole marketplace and square took on a different form. No longer was it a scene of life and endless fascinations and excitement, but rather a way for lots of desperate people to do whatever it took for them to make money, and to make a living. And their forwardness knew no bounds. At every circle around a performer which I passed, I noticed an extra person making their way through the crowd and asking for money, with the penalty of embarrassment if they refused, as had happened to me. I took extra care to watch from a distance and avoid any more awkward situations. Terribly poor people in tattered clothes, often young children, ran around desperately trying to sell things such as little packets of napkins and worthless plastic trinkets to tourists, just to make a dirham or two, each of them with the most heartbreaking looks on their faces. The long rows of tables and mini outdoor restaurants all had waiters who would stand out front with a menu and practically fight their way to coerce a tourist to their specific restaurant over another. One waiter did everything he could to get me to buy dinner at his restaurant right then and there, and I promised I would come back later just to get away from the conversation and his endless attempts at persuasion. 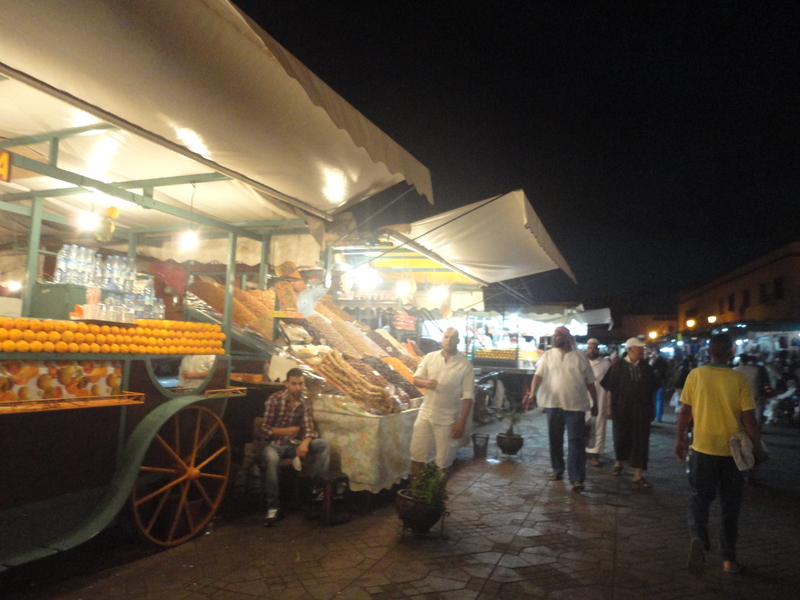 I arrived to the row of steaming carts and discovered the source of the steam: Morocco’s favorite street food, escargot. Pots of snails sat at each cart and people stood around them, picking cooked snails out of their shells with toothpicks and then drinking the herbal broth it was cooked in afterward for its supposed health benefits. Having already tried the salty ocean-like food, I avoided the carts and instead went straight for the line of orange juice stalls beyond for some refreshment. There were practically a dozen of these carts, with men creating freshly squeezed and delicious glasses of orange juice right there for the equivalent of $.30 USD. And also once again, my potential business was fought over. Each cart was an exact replica of the next, so the only way to advertise and increase business was to shout out and convince as many people to come to their stalls as they could. And so the shouting match commenced and I let myself be drawn to the nearest stall, and gulped down the delicious orange liquid, fresher than anything I’d ever tasted in North America. It was so worth it. I moved on to pass tables of bottles with vendors shouting out the magical or healing properties which each possessed. I saw one tan scarf that sort of appealed to me in one store, so I wandered in and almost immediately was overtaken by the shopkeeper who rambled on in very good English about the quality of his goods. He was obviously very intent on selling something, as was everyone else in the square. I stayed only for a few moments out of being polite before excusing myself and dashing away, without having bought any scarves, due to the exorbitant prices. 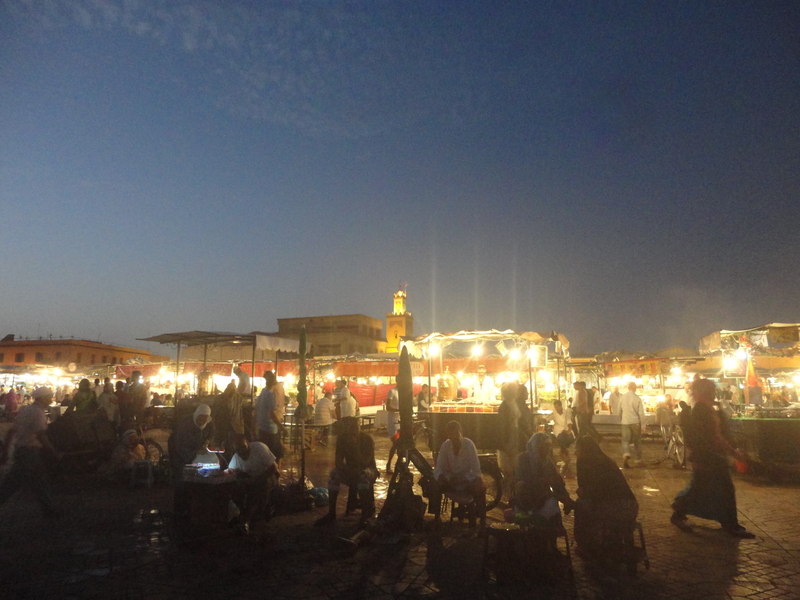 It seemed the Jemaa el Fna was also the most expensive place in Morocco to buy souvenirs. I wandered past a line of henna ladies, each one either busily creating a design on a tourist’s hand or foot, or haphazardly running around trying to recruit customers. I found myself becoming immersed in watching one particularly skilled artist create an amazing design that wound its way up a girl’s arm. And that was when she came up to me. At first all I felt was something brush past my genie pants, and then I felt a light tug and looked down to discover the culprit. A young girl stood there, tugging on my pants and staring up at me with wide brown eyes. Her thick, dark hair was pulled back into a ponytail and her other hand was stretched toward me, holding one of the little packets of tissues that so many other children like her were running around trying to sell. 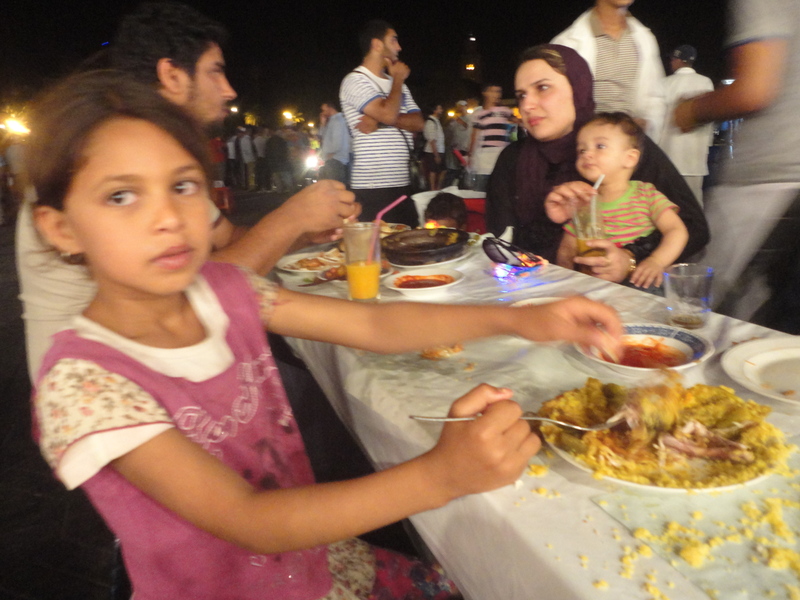 I could feel the sadness come over me as I prepared to give her a remorseful “La, Shukran”, or “No, thank you”, as I had to many other children and desperate people during my time in Morocco. But, I couldn’t find the words as I looked down into her deep, sad eyes. It was no wonder the parents sent their children to do this work rather than them, because the children probably had more success with their puppy dog eyes. That’s when I realized that giving her a few dirhams, whether I took the tissues or not, wasn’t going to help her or anything. Children shouldn’t be businessmen, they should be in school. This little girl deserved something different for a change in her hard, young life, even if it was something small. So, I knelt down and, after insisting I didn’t want the tissues, asked her “Bagheeti aa’seer alboortuqal?” “Do you want some orange juice?” Her eyes lit up at the words as every little girl’s should, and she took my hand and followed me as I made my way to the row of orange juice stands. As I ordered one glass, I asked the little girl her name and age. She was only 7 years old, and her name was Zahara, which meant flower in Arabic. A huge smile spread across her face when I brought the orange juice down to her and put it in her outstretched hands. It wasn’t much, but at the very least it would give her some hydration, and it was something sweet for her to enjoy. Suddenly, as if coming from nowhere, a dark figure appeared at my side. I looked to find a short woman standing beside me, her whole body covered in black except for two piercing, kohl-lined eyes that looked at me earnestly. “Henna? Henna? Hennaaa?” She asked again and again. I shook my head and backed away, turning towards Zahara to make sure she was enjoying her orange juice in peace, which she was. The henna lady grabbed my hand and started creating a design on it without any affirmation from me. I tried to pull my hand away, but decided against it and gave in to the henna pen, and was led to a stool not a few feet away. I sighed in exasperation but let the henna lady continue her work, and waved a goodbye to the little girl as she smiled and waved back, glass in her hand. Remembering the henna I had gotten back in my host Moroccan city, Meknes, and how a design of a similar size on my hand had been 10 dirhams, I expected the same here. 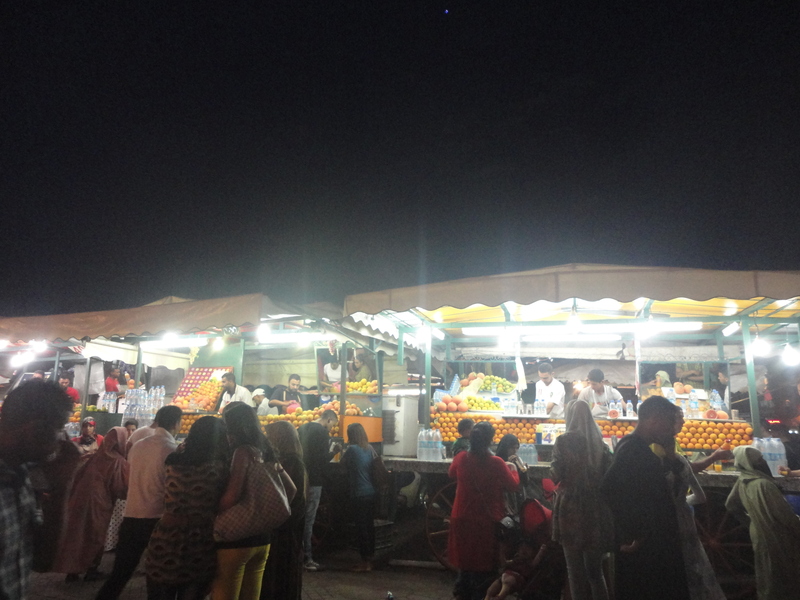 At the most, it would maybe be 20 or 30 given the location here in Marrakesh., which amounted to no more than $3-5. But nonetheless, I was still annoyed that this lady had practically forced me into getting some henna done. Within two minutes the woman had finished her small design, and she then grabbed a handful of glitter which she cast over it before looking back up at me. “Okay, this be 700 dirhams,” she stated. I could feel my face contort and my mouth go agape as I blurted out, “WHAT? !” This lady had to be joking. No way I was going to pay her that much. That was ridiculous. “Yes, see here, this worth 400 and 300 so 700. But I give you low price, 500. Ok?” I wasn’t having any of this. It dawned on me that she probably did this every day, trying to scam unsuspecting foreigners out of their money. 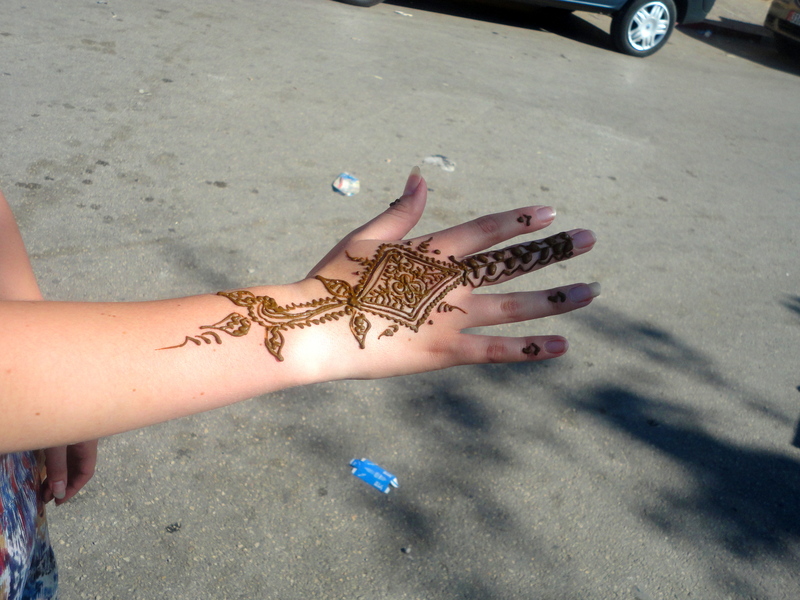 I began to argue with her, raising my voice only slightly as I tried to explain that her price was ridiculous, and how i had gotten the same henna in Meknes for only 10 dirhams. The henna lady refused to accept my words. She continued to shake her head and say “No, no no, 600 dirhams! No!” Frustration and anger overcame me as I argued with her even more and tried to make myself understood, but it was pointless. The henna lady wasn’t listening to me, as her incessant “No’s” and rambling drowned out my words. I felt eyes on me and turned to see another foreign girl a few feet away getting a henna design on her leg, as she looked on and observed our argument. “See that girl, that design 400 dirhams!” The lady shouted at me, pointing to the other girl I had glanced over at. All I could think was how this tourist had absolutely no idea she was being scammed out of a whole lot of money over some measly little leg tattoo. The tension of the situation increased with the volume in our voices. More eyes were turning our way. I had to get out of this somehow, before things got worse, and there was no way I was paying her the 500 or 600 dirhams which I didn’t even have. I stood up abruptly, letting the anger and frustration get to me as I shouted out “Here! Take this!” I flung a 20 dirham bill at her along with a bunch of coins that flew out of my hand and clattered to the ground at her feet. “That’s all I have and that’s all you’re getting!” I turned and practically ran to get away from her and that situation as quickly as possible, before the woman could argue any longer. Tears of frustration stung my eyes as I walked away, my mind swimming with curses and anger at that crazy henna lady and at myself for falling into that scam trap. Zahara, the 7 year old girl, crossed my mind and I looked around to find her, but she was nowhere to be seen. I passed by the row of restaurant tables again, and the same waiter approached me. “Ahh, you are back and it is later, will you eat dinner here now?” When I looked up, he noticed the tears in my eyes and his voice went soft. “Oh no, why are you sad? What make you cry? Don’t be sad, be happy.” His words brought a smile to my face and I decided to sit down at a table and calm myself, before ordering a small tajine and a drink. I looked back up at the crowds passing by and forced myself to see the positivity in it all again. Two bad experiences had warped my perceptions of this place and people and what they’d do just to get money. But to think, was everyone here really that desperate? Were their situations so bad? My eyes caught a face in the passing crowds staring back at me, and I recognized Zahara. A smile broke out across my face. This was the light I’d been hoping for. I beckoned for her to come sit with me, and the girl obliged and walked over. I couldn’t make a difference in all of these people’s lives, nor could I change any of their situations so that people didn’t think they needed to resort to scams. However, I could make a difference in one person’s life for one night, even if it was small. And so I had Zahara join me for dinner, and I bought her a meal. She hungrily ate the fish tajine I had brought out for her, the same waiter watching me with a new look of respect. I talked with the girl, asking if she liked school and about her favorite classes and hobbies in my broken combination of Modern Standard Arabic and Moroccan dialect words I had picked up. She loved school very much, she said to me, saying it was her favorite part of the week. The look I had seen on her face when she first appeared at my side not even an hour beforehand had disappeared, and was now replaced by a smile. I could feel her happiness infecting me and thus making me feel happier by the second. I just explained to him that I felt like it was the nice thing to do instead of buying the tissues she had been desperately trying to sell, and he in turn remarked about how kind it was of me. 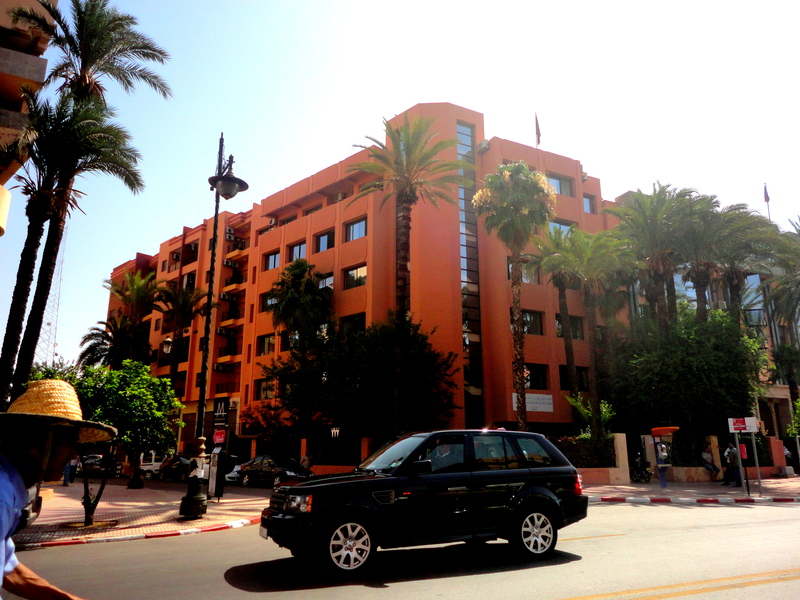 I began a conversation with the man, whom I learned was from Libya and on vacation in Morocco with his family. He had attended a university in Malaysia many years ago and now owned his own company. At first, he fretted that I might have a bad image of him and his people because of events and the political situations in his country, but I reassured him I didn’t judge individuals based on where they were from. We chatted about friends, family, religion, and traveling, among other topics. Zahara tugged on my shirt all of a sudden, and pointed out into the crowd. “Ummi!” She said, smiling. “My mother!” A woman in the crowd with the drawn face of a life in hardship stared back with curiosity and apprehension. I told Zahara to invite her mother over, and soon enough the little girl was dragging her mother by the hand to the table. She sat down across from me and watched her daughter with a hint of a smile. When I offered her some of my dinner, she took a small bite but refused any more. The Libyan man, still watching the situation, suddenly announced. “You know what? Let’s keep this going.” He asked the waiter to bring out orange juice for everyone, as well as a plate of food for Zahara’s mother. Soon enough, everybody at the table was smiling and laughing and talking and eating together. I struggled to understand words from the conversations in Arabic, but still enjoyed every minute of it. All of the negative emotions I had been experiencing earlier faded away as I watched this wonderful scene unfold before me. The crazy henna lady, the over-obnoxious vendors — sitting here with these people made up for it all. I hoped this chain reaction of kindness would continue on, with the Libyan family, with me, and with our two guests at the table. After receiving a million words of blessing and thanks from Zahara’s mother, a small Shukran from the little girl herself, and waving goodbye to my new Libyan friends, it was time to leave the Jemaa el Fna behind. 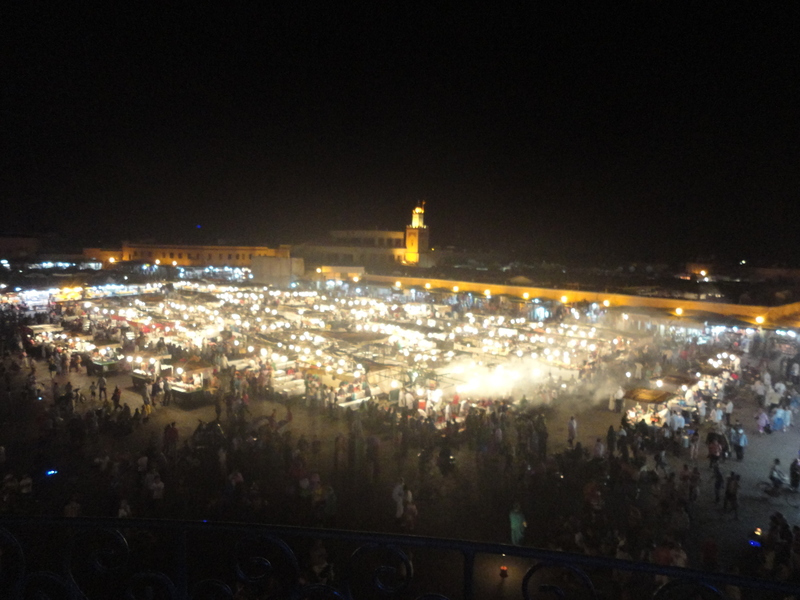 I will always tell people that Marrakesh is my least favorite city of Morocco, and that the Jemaa el Fna is overrated, due to the high number of hasslers and scammers and tourist craziness of the place. However, after my experiences in the marketplace, I can’t help but agree with those words I saw in the guidebook: “essential experience”. The Jemaa el Fna is just a whole lot of overstimulation, from loud noises and music to smells of all kinds, to infinite arrays of items up for sale. It will test your resolve and strength, with scammers and pickpockets lurking at every turn, and then reward you with the most delicious orange juice in the world. And most importantly, it will show you the best and the worst of the human spirit. And maybe, just maybe, you’ll have an experience similar to mine from which you can learn. And just maybe, you’ll lend a hand to help out one of the hungry children wandering about, and the experience will have such an impact on you that you will never look at the world the same way again. This, was how the Jemaa el Fna left its mark on me, and I will never forget the crazy henna lady, nor the little girl named Zahara whom I met there.